While the Naples market offers a wide array of options for buyers seeking a reprieve from the winter elements and beyond, there are a few select neighborhoods that are very popular amongst a wide cross section of buyers. Olde Naples, Gulf Shore Boulevard and Pelican Bay have a dedicated following and our detailed review provides a barometer of true market activity and allows for the possible foretelling of market trends. This synopsis is based on market activity that the Naples Meridian Group has been involved in and has researched for clients. Downtown properties continued to be in high demand with 2 Bed + Den and 3 Beds condominiums and villas being the most popular (1700-2400 sq. ft.) with an average selling figure of $ 1.2 Million. The big news along 5th Avenue South was the launch of a new mixed use development located at 465 5th Avenue South owned by local hotelier Phil McCabe, where only a few sales materialized (3 Bed and 3 Bed + Den) with an average selling price of $ 2.5 Million. There is said to be show models in the works and we expect the balance of the sales, 10 in total, to transact in 2019. The bigger story on 5th Avenue South is the first floor commercial offering that remains vacant at McCabe’s building and next door at 505 5th Avenue along with commercial space at 875 6th Ave S which contains 8 residential units in total; 3 Beds + Den with an average price of $ 2.5 Million. This building offers limited views and is positioned next to the city parking garage. A vast amount of vacant commercial space is not ideal for selling residential property and with commercial rent levels at a premium, 2019 will be an interesting year to see when the residential sales rate within three mixed used buildings along the most illustrious street in Naples kicks into a new gear. Villas in Olde Naples within blocks to the beach are still the most desirable type of real estate. At time of press, there were only a handful of resale options priced under $ 3Million which offered buyers some version of “move in ready” residences at best. Over the summer a variety of single family homes sold; 4 Bed + Den and 3,700 sq. ft. located in striking distance to the beach and close to 5th Avenue South and 3rd Street South, with an average selling price of $ 3.4Million. In 2017 we assisted clients purchase a 2 bedroom condominium in a beach front building that had stellar gulf views and premium amenities such as a large pool and guest suites. Un-renovated options were trading at $ 1.3Million. In 2018 that number jumped to $ 1.7Million. The market for true gulf front properties is on fire as many beach front condominiums have views, yet the position of the building allows for only angled gulf views instead of highly coveted wide panorama views of the Gulf of Mexico. In addition, buyers are taking a tougher line, perhaps due to Hurricane Irma, in that they are less interested in purchasing a property in a building constructed in the 1960’s or 1970’s. Therefore, much of the attention has shifted away from the Moorings neighborhood and instead has raised the ante in Park Shore. 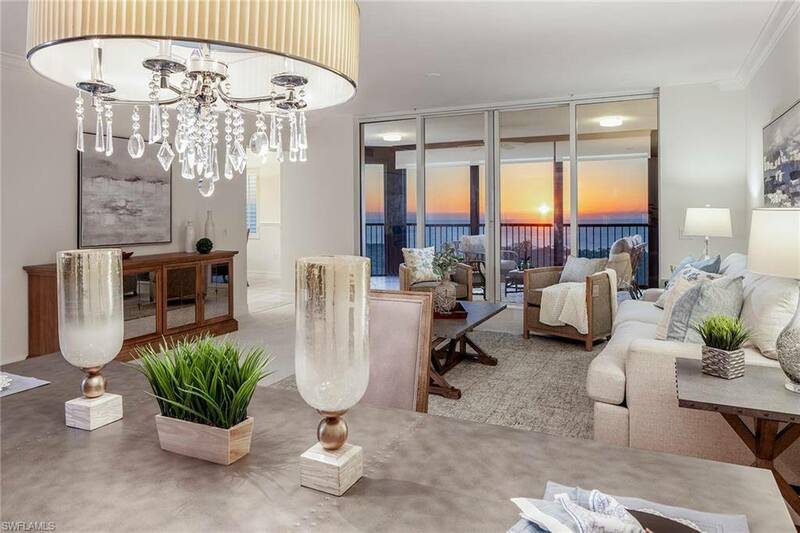 In 2018 there were 29 closed condominiums sales in the Moorings with several taking place at Admiralty Point, Lausanne and Naples Continental with selling prices from $ 670,000 to $ 2.15Million. In comparison, there were 90 high rise sales in Park Shore with selling prices from $ 650,000 to $ 5.8Million with 4 + sales taking place at Le Parc, Savoy, Aria, Monaco, Esplanade and Vistas. This master planned North Naples neighborhood encompasses a 3-square-mile enclave and keeps its treasures reserved for residents. With its private beaches accessible only by tram residents enjoy sea kayaking, sailing and staying fit with beach front exercise classes, all before dining at surfside restaurants. Pelican Bay also offers a private members golf club and multiple recreational facilities, while Bay Colony often noted as the crown jewel of Pelican Bay, offers beachfront high rise condominiums and single family homes with exclusive access to a newly updated private beach club and dining room. For all Pelican Bay offers, this community surprisingly only traded 284 properties in 2018. This drop in activity could also be attributed to the aftermath effects of Hurricane Irma where roof repairs or replacements were necessary. Fatima S. Khokhar is the managing principal of Naples Meridian Group, and specializes in providing independent and confidential property consultancy and sales services to clients, investment groups and property developers.